MARVELOUS INTRA COASTAL & CITY VIEWS. TILE IN ALL AREAS, REMODELED KITCHEN, NEW IMPACT WINDOWS AND SLIDING DOORS. NEW A/C. 1 PARKING SPACE AND ONE STORAGE ASSIGNED. FRIENDLY SMALL BUILDING ON GOLDEN ISLE WITH DOCKAGE FOR A SMALL BOAT. NO PETS. NO RENTAL ALLOWED. GREAT LOCATION. WALKING DISTANCE TO RESTAURANTS, SUPERMARKETS AND SHOPPING CENTER. 1 MILE TO THE BEACH. 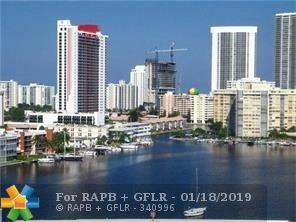 CLOSE TO GULF STREAM RACE TRACK, BEACH, AVENTURA MALL. This listing is courtesy of Universal Brokers.